Trampolines are a staple in many backyards and, although they provide hours of fun, people who use them can get hurt. About 104,729 people were treated in an emergency room in 2006 for a trampoline injury, according to Livestrong.com. A majority of injuries are fractures and sprains, according to the American Academy of Orthopaedic Surgeons. These types of injuries are treatable at an urgent care clinic at a lower cost than an emergency room visit. Here are a few trampoline-related injuries and how to help prevent them. There are ways to help prevent injury. Be sure to cover the springs with padding to help prevent falls on the springs. Periodically inspect the padding for tears and the springs and frames for rust. To limit collisions with other jumpers set a strict “only one jumper” rule, Livestrong.com suggests. 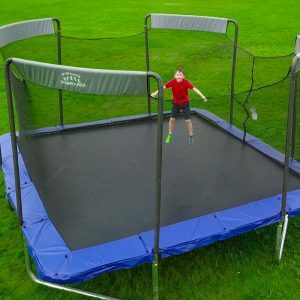 An enclosure around the trampoline can help limit falls. Placing the trampoline away from trees and off of hard surfaces like rocks and concrete is also recommended. Ideally, you would want to place the trampoline as close to the ground as possible, but this may not be an option. Slate.com also recommends limiting trampoline use to children aged 6 and older. Limiting stunts like sumersaults and flips may also decrease the likelihood of injury. Adult supervision is an added security. If you, your family, or someone you know is injured while jumping on a trampoline stop by Advanced Urgent Care & Occupational Medicine. We have an X-ray machine on-site at all three of our locations in Brighton, Ft. Lupton, and Northglenn to help diagnose fractures. You’ll be given a CD of the images to take with you to your primary care provider or specialist. Call us at 303-659-9700 with any questions and view clinic wait times here.